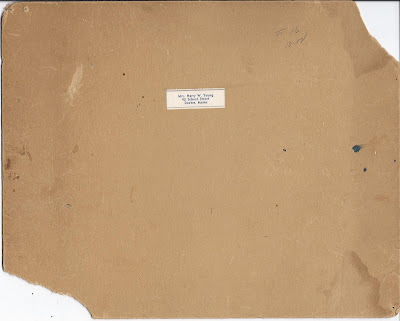 Vintage photograph of students and instructors that is likely from the Dexter, Maine area, as indicated by a sticker on reverse with the name of Mrs. Harry W. Young, 43 School Street, Dexter, Maine. Harry W. Young was born about 1886 in Maine, the son of Fred M. and Minnie Frances (Butters) Young, both born in Exeter, Maine. His paternal grandparents were Elias T. and Sarah (Cleveland) Young. His maternal grandparents were Simeon Warren Butters and wife Mary Ann (Titus) Butters. Harry W. Young subsequently married Mabel (Slater) Sims. She was born 30 October 1888 at Dexter, Maine, the daughter of George M. and Emily A. (Martin) Slater. 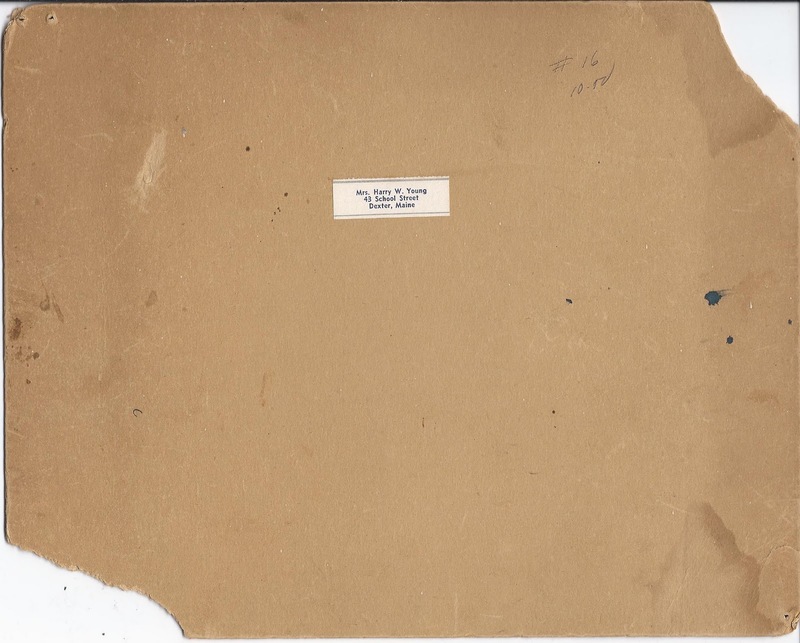 I'm not sure which Mrs. Harry W. Young affixed the sticker to the reverse of the photograph, but I'm leaning toward June M. (Parsons) Young. It's possible that she or her husband was a student or a teacher in the photograph. If you have any corrections to the information presented here, or if you have any insights into the photograph, please leave a comment or contact me directly. Hi! I can add that Mabel Slater was first married to George H. Royal of Hermon, ME. They were married in Lynn, MA c. 1910. George died in 1914. Mabel's second husband was Charles Bray Simms who was born February 19, 1895 in Gloucester, MA. Charles died in Broward County, FL sometime in the 1950's. His place of burial is unknown. Mabel then married Harry Young, as you state! Hope this helps! Thanks to your helpful timeline, Heidi, I'm leaning even more toward June (Parsons) Young as the person represented on the sticker. Thank you for taking the time to comment. Harry W. & June Parsons Young are my wife's grandparents. All of the above family background is correct. June died April 20, 1940 in Dexter. Harry then married Mabel Slater Royal Simms. I have more info on all of them if anyone wants it. 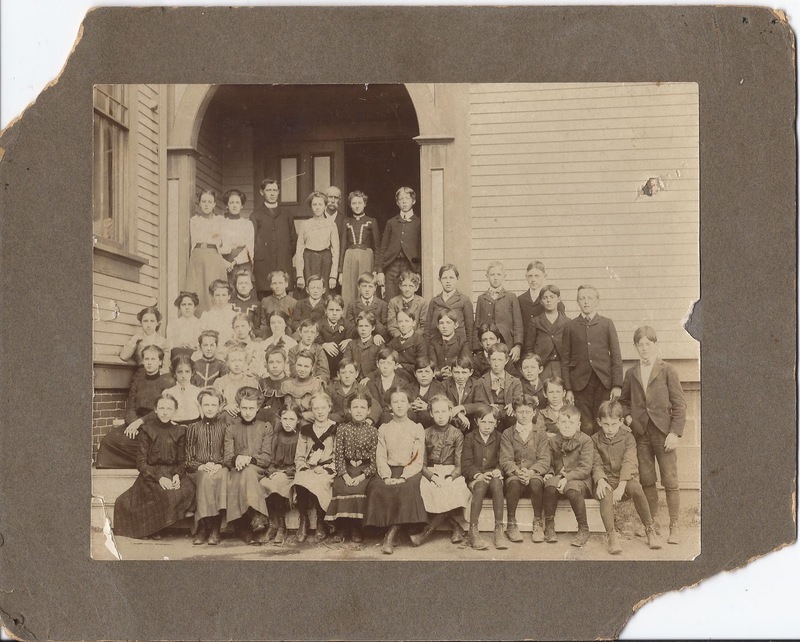 In the photograph you posted December 21, 2010 entitled "1903 Photograph of Class of Second Grammar School, Dexter, Maine" June Parsons is in the front row, the third seated girl from the left. Mabel is the girl next to her. I can't definitely identify either of them in this larger, and probably earlier, picture.